My sister was born on Halloween, so I am no stranger to all of the common tropes that follow such a holiday. There are pumpkins to carve, candy to pass out, and the movie Hocus Pocus to watch at least once, all done to commemorate such a special occasion. Another major trait that Halloween almost always has is the prevalence of ghosts. Ghosts are not real (like most other phenomenon hosted during that time of year) but they usually beg the question: what if? If ghosts suddenly became corporeal tomorrow, would you avoid them entirely? Or would you attempt to converse with them to learn more about who they happened to be? Re-Kan! focuses on these supernatural beings, giving an anime that relaxes both body and mind. Re-Kan! stars Hibiki Amami, a young woman who has a sixth-sense, allowing her to communicate with entities that are no longer living. One day, she happens upon Narumi Inoue, with the two becoming at least acquaintances and the tale progressing from there. Ghosts are most often perceived as scary, what with their translucent bodies, ability to float, and the hauntings they take part in. But here, in Re-Kan!, ghosts are the complete opposite. They help the characters with the problems that appear, they are generally kind in their normal dealings, and they refrain from harassing the living. For example, the ghosts at one point watch over Amami’s inner spirit or assist in the school festival’s haunted house. 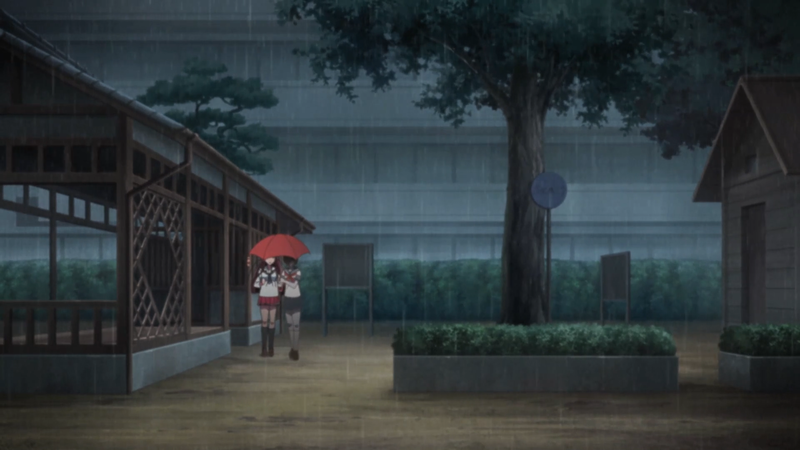 This is the first sign of the anime being able to generate such a calming atmosphere. By taking a concept that is normally seen as horrifying and diluting it to the point of cuteness, the anime is able showcase its relaxation to a higher degree. It is not so much dissonance as it is dichotomy; the application of a subject that is not usually placed in such a positive light makes it so that the anime’s calmness is more pronounced than if such contrast was not employed. Re-Kan! continues building its calm atmosphere through the construction of the narrative itself. Here, the anime avoids any lasting tension by foregoing long-stretched conflicts, instead opting for an episodic, “monster (ghost) of the week” format. There do exist partial carry-overs between episodes – such as specific ghosts or allusions to previous happenings – but for the most part, the anime keeps each tiny tale segmented from one another. The drama is there but the resolution comes quickly, giving the anime the chance to showcase more heartfelt moments like an elderly man enjoying his wife’s homemade chocolates or a little girl getting to play with her childhood friend. While the individual occurrences are not profound or deeply moving, they manage to sit snuggly among the show’s tone, thereby heightening its relaxing effect once more. To round out the experience, the anime focuses on a specific theme to unify the disjointed events: the small things in life matter most. It is quite simple, but this aspect, like the others before it, finds easy comfort due to the endearing nature of the motif. Many of these moments demonstrate this idea. For instance, a group of small kids running around in the park and a mother hugging her daughter are the kinds of occurrences that do not seem like much but are quite relatable. In fact they almost come off as insignificant, but in essence that is life itself, a series of “forgettable” happenings that are small in scale now but have a large, everlasting impact later on. This is exactly where the anime goes as it comes to its conclusion; these “insignificant” moments are revealed to be more than what they are at face value. Those little kids allowed Inoue to understand the connectedness she herself has, and the mother becomes inspired to cook like she used to. The majority of the previous plot points are revisited to showcase how such small events really do have quite the impact. However, the most profound part is that this message is revealed through thedead. That is, cherishing life’s smaller experiences is made possible by the non-living. It is ironic, but again, this dichotomy gives it added meaning since they are the ones who can no longer do this. In other words, everyone eventually moves on, so love the small things as much as you can while the opportunity is still there. Now, the entire outing is by no means perfect – there are specific plot points that are not fully expanded on or used, such as Mary the cellphone ghost; and the comedy often relies on the same, repetitive jokes – but as an anime aimed at healing its audience, Re-Kan! performs at a very nice level. Re-Kan! takes a strange approach to its art style. The best way to describe it is that the backgrounds are three-dimensional in nature, or that the characters are quite obviously superimposed onto the setting they find themselves in. By doing this, the art takes on a “photorealistic” effect that helps to keep the anime’s sense of realism despite the ghosts that permeate it. 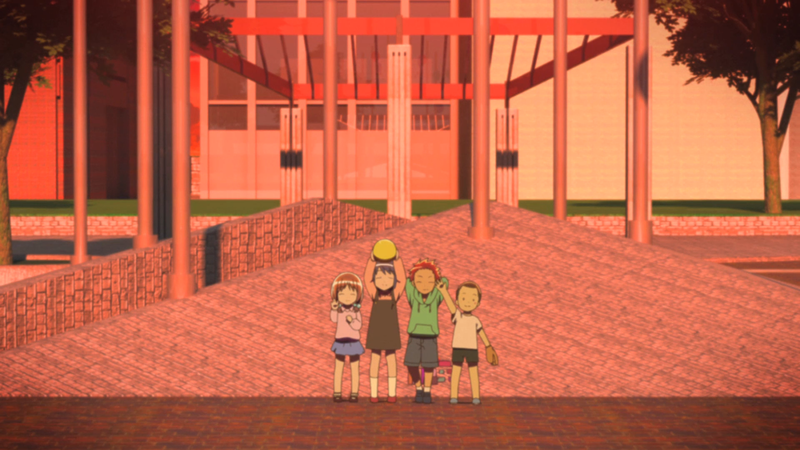 Various locations are visited, like the beach, parts of the city, and Amami’s abode, but the show takes place mostly at their school. While the style can take a while to get used to, and the lighting and camera direction are nothing noteworthy, it does its job handily enough. The character designs are weird mainly due to how shiny everyone is. Hair, eyes, and skin all have this sheen to them that makes the members of the cast glow. In a way, it makes them seem unnatural, in the same vein that the ghosts are “not of this world.” Besides their shininess, characters like Amami with her long purple hair or Inoue with her short twin-tails are appropriate but not too dazzling. Actual animation barely manages to be average in execution. The characters do not do much in terms of movement, sticking mostly to sitting or standing while having their conversations. A possible reason for the anime’s direction here was to keep the feeling low-key; preventing the characters from engaging in gratuitous action coincides with the relaxation it was going for. However, when the characters do move, it can be somewhat choppy, such as with running or during reactions. In an anime like Re-Kan!, the characters are not looking to be complex or incredibly fleshed-out. This is apparent when noticing the lack of drama (no personal conflict) and the format of the plot (no long-lasting effects) which causes the characters to refrain from developing to any extent. Meaning there needs to be some leniency applied when analyzing said characters. To this end, the anime is competent with at least the characterization of the main troupe it touts. Some of them are rather interesting, such as Kyouko’s past as a thug who protected the streets and Ogawa’s infatuation with zombies. Others are common tropes found throughout the medium, such as Inoue the “tsundere” and Amami the super-nice young woman. While each does get an episode that semi-revolves around them, such as Kana having issues at home and Ogawa aiding a possessed doll, again it is more about using their shticks in the moment – either to further the comedy or drive home the sentimental idea for those events – as opposed to expounding on their actual persons. The same direction can be seen with the minor characters, like Ko-gal Spirit and the “Roll Call Samurai.” The former reconnects with her mother in a tender moment but later on is used as comedic relief whereas the latter is humbled by Amami’s kindness, so he makes it his mission to protect her, which leads to his own type of gags. So, while the characters do not individually go through much, their respective personality traits are at least shown and used in an acceptable manner. More powerful than each character’s singular facets are the bonds that they share between each other. The idea that the connections people have with one another being important is introduced in the “final” episode, but in retrospect it becomes clear how much focus was placed on the relationships established. 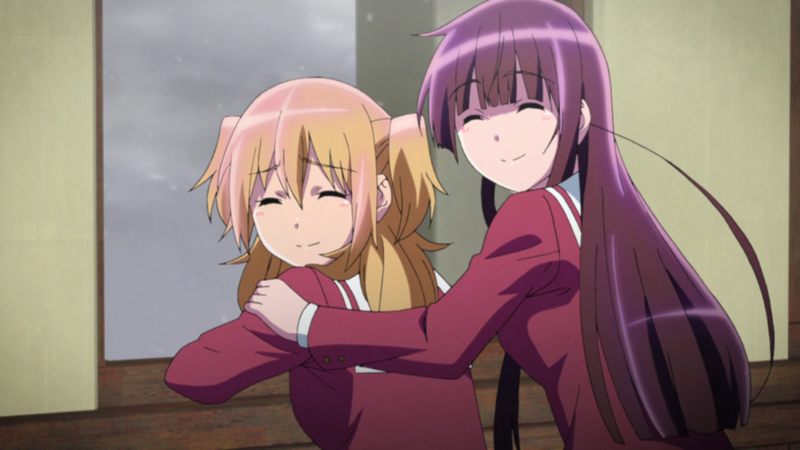 Kyouko and Kana get angry at each other all of the time, but that is because they understand one another due to the rough-and-tumble attitudes they own. Ogawa and Yamada also manage to relate to one another due to their outlier status. Ogawa’s obsession and Yamada’s “anti-harem” role make them stand-out from the rest of the group, allowing them to get one another more readily. Even the relationship between Ko-gal and Samurai has a foundation. Ko-gal’s laidback nature contrasts with Samurai’s dignified manner of behaving and speaking, which causes the two to tease one another as only companions could. Best of all is the dynamic between Amami and Inoue. Amami is unbelievably gentle and enjoys communicating with people of the transparent variety. Inoue rests at the opposite end of the spectrum; she can be rude and overly-direct at times yet she is deathly afraid of ghosts. But as a testament to the strong bond they share, the two overcome such a huge gap in differences and become the best of friends. 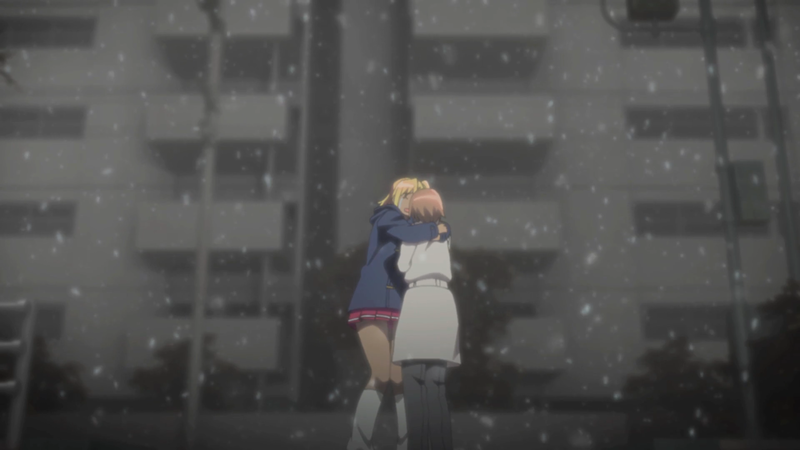 Amami gives others the chance to see Inoue’s kindness hidden behind her abrasiveness, such as when Inoue agreed to continue being next to her, and Inoue gives Amami a backbone, a wall to lean on when troubles arise, like when Amami was forced by Inoue to wear ghost-warding glasses to let her friend rest. They appear to be the most unlikely of duos, but that is precisely why they are so close to begin with. Amongst Re-Kan!’s characters, it is clear that the understanding relationship shared between Amami and Inoue is one of the stronger parts offered. The opening theme starts off well then heads into quite the guitar riff, which eventually devolves into a tired beat and a bout of singing that is not entirely pleasant. However, when the second half of the track begins – where it matches the very beginning – it finds strength once more, with the nice catchiness and the back-and-forth vocalists. The ending theme is oddly quick, but it works because of the contrast it has with the anime that precedes it – this contrast being a common motif found throughout the anime. It contains many various sound-effects, fast singing, build-ups, tonal changes, and catchy lyrics that come together to create a fun song to hear. The rest of the soundtrack presents an arrangement that sticks to relaxation. There are goofy pieces like the ones that play during rambunctious moments – a distinct, ghostly whistle can be heard during one – and serene piano pieces for those sad moments, but many of the tracks are composed with softness in mind. One of the most prominent and memorable tracks from the show is the four-note, acoustic guitar ensemble that captures the sweetness that is everyday life. The OST is by no means great, but it manages to contain a number of pieces that follow the atmosphere nicely. Voice acting for the anime is somewhere around average. A special shout-out is deserved for Ibuki Kido as Amami for her extremely kind way of speaking. I like cute anime; anyone who knows me knows this to be true. And this one definitely fits the bill mostly thanks to Amami’s unending kindness and affability. Her simply saying “Inoue-san…” in her gentle voice was more than enough. But watching her stumble around, helping the ghosts and the living alike, would always make me smile because she was smiling while doing it. Viewing someone that is doing what they love, seeing as their passion manifests, makes me happy because that is something everyone should experience. The only other character I cared for was Inoue, who was also a source of entertainment due to her scaredy-cat ways. It was always a game, trying to see where she was hiding in the background when ghosts entered the area, or watching as she shook and panicked while screaming “no” with her hands to her cheeks. Her relationship with Amami – with the “yuri” undertones, strictness (as the show put it), and “tsundere”-ness towards her best friend – was hilarious because of how genuine it was. Amami’s innocence was something that Inoue never took for granted, with Inoue wanting nothing but the best for the girl that, as she did with the ghosts around them, treated her so well. Beyond the comedy, there were two moments that managed to tug at my heartstrings. The first was with “Little Ghost Girl” who got to play kitchen with the boy (now a grown-up) she made friends with years ago. 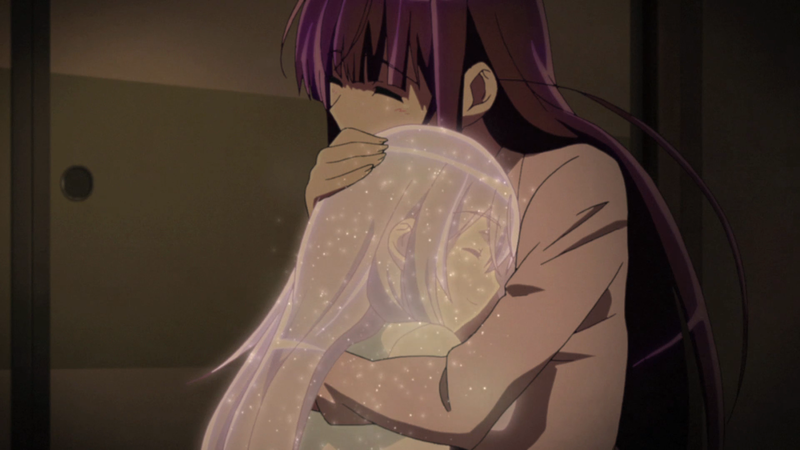 I hate goodbyes, and the one between her, the gang, and Moriya was very touching. The other moment was when Amami realized just how much she impacted the people around her, subsequently getting her sixth sense back. It was a tender moment between her and Inoue, bringing about both a fulfilling and satisfying conclusion. Re-Kan! targets more than just ghosts. Championing simplicity and the connections we hold with the people around us, the anime manages to be a relaxing ride with heartfelt roots. While it is somewhat weak in its art and music department, those aspects do not dissuade the notion that, corporeal or not, life is a truly beautiful entity. I liked this show. It was cute, funny, emotional and features a pervy cat. The little ghost girl is cute… my eyes – who is cutting onions? > The little ghost girl is cute… my eyes – who is cutting onions? I loved that little story. Heartfelt and endearing, while also ending on a sincere note. It wasn’t spectacular — that tale and the series itself — but it provided just enough relaxation at every turn.